BANEPA, Oct 23: The National Reconstruction Authority (NRA) had selected Rabiopi VDC of Kavre district as a model village for distributing housing reconstruction grants to the 2015 earthquake victims. At that time, government officials had reached the VDC and handed the victims with copies of agreement to the delight of the villagers. It did not take much time for the initial excitement to fizzle out as the agreement was soon forgotten. The excitement turned into disappointment. 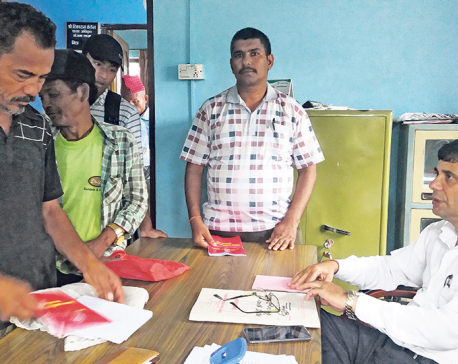 Majority of the locals not only faced delay in receiving the first and second tranches of the grant, but the third tranche is still a far cry after two-and-a-half years of the magnitude 7.8 quake. “The delay in distribution of the first tranche of grant was understandable as we thought that the authorities were weighing up the best system to do the work efficiently. Their incompetence was exposed when the distribution of the second tranche took months after the agreement was signed,” said Pradhun Thapa of Rabiopi-8. He has already built his home and has been recommended for the third tranche of the grant. But he has still not received the grant. Likewise, Sushila Koirala of Rabiopi-2 also has been recommended by NRA engineer for the third tranche of grant after fulfilling all the criteria set by the NRA. She also has been waiting for the grant. Their stories are similar to the plights of hundreds of other quake victims of the VDC as well as in the district itself. Their fate, however, remains unchanged despite the visits of the district officials of the Department of Urban Development and Building Construction, District Technical Office and other authorities on a daily basis. Despite insurmountable complaints, concerned authorities are unwilling to admit their inefficiency. “I have heard that banks have not made the transaction of checks for quake victims due to Dashain and Tihar. We will promptly inquire about it,” said engineer Loknath Regmi, chief of the District Technical Office.